Okay I think the time has come to share this project with you all! 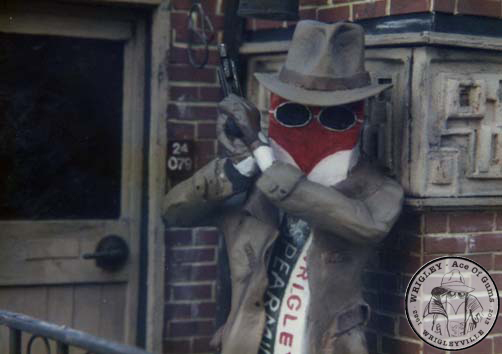 My friend and I were inspired by Blade Runner to do this project, back in 1983 when I was about 19. In a way this post belongs on my Blast(er) from the past thread. But the content is more suited to this section of the forum I think. 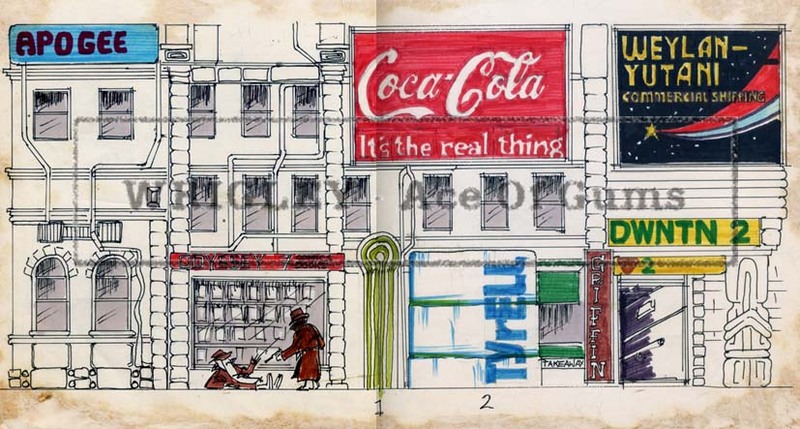 'Wrigley Ace Of Gums' was a little stop motion film idea I dreamt up about a packet of Wrigley's chewing gum who was a private detective, or should I say Gumshoe! At the time there was a First World War drama on British television called 'Rilley Ace Of Spies'. This inspired me to come up with the title 'Wrigley Ace Of Gums'! And so the character Wrigley was born! My friend and I designed the characters and set, then I was able to begin construction. At the time we were (and still are) really into Blade Runner. 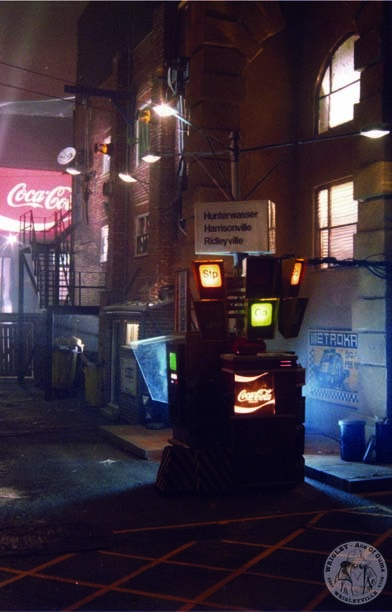 As we designed the set we took many cues from Blade Runner and so "Wrigleyville" was born. Wrigley was no ordinary (chewing) gumshoe, he was the best! 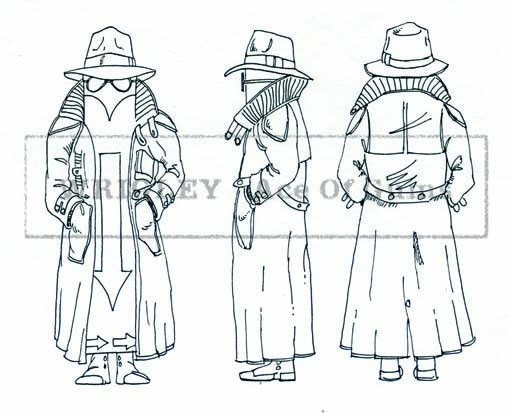 So what could be better than giving him a Rick Deckard raincoat and an Indiana Jones style hat? A dapper pair of spats and shades finish off the look! 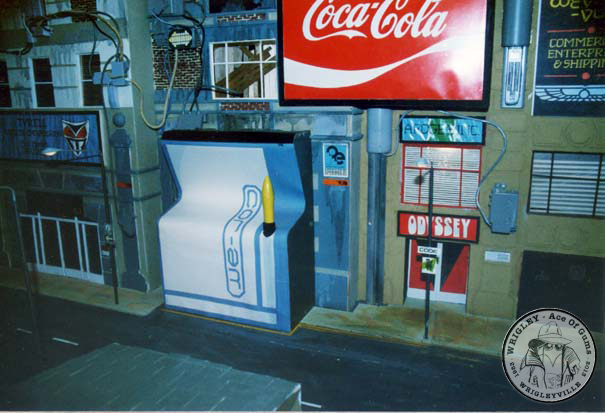 I set about making the model on an eight by four foot sheet of chipboard in my parents’ garage. For the walls I built simple timber frames and clad these with mount board. Then using more cardboard, balsa wood and anything else I could get my hands on I applied the details. I built it in sections so I could dismantle it and store it in the corner of the spare bedroom. It took us five years to complete (on and off, in between college work, in our spare time). As we went along my friend created various graphics, using photocopies, rubdowns, pens, markers and coloured Letraset films. All the graphics were in-jokes and lots of them borrowed from various places! In the end we never got around to making the film but I did finish the set, though I could have gone on and on…. By the time the build was complete, I had finished college and needed to get a job. It was taking up a lot of space, so we made the decision to photograph it and then finally consign it to history. I kept the traffic light machine and the wheelie bin and for a while I kept the fire escape but in the end that had to go too. When we photographed the set we took some shots outside in daylight and some indoors in my parents’ garage. To create the smoke I dismantled fireworks and ignited small piles of loose gunpowder. A mushroom cloud would first go up into the roof space, then after a few minutes begin to drift down and fill the garage with smoke. 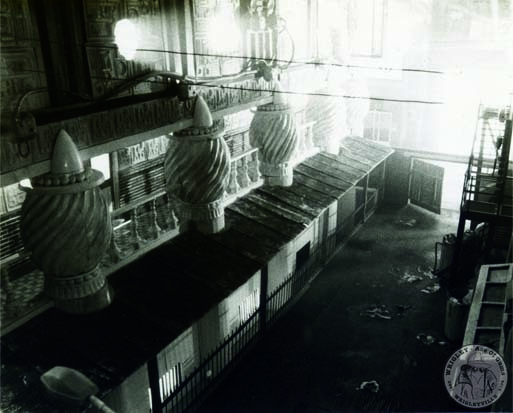 We kept the doors shut to keep the smoke in, no regard for health and safety back then! I don't suppose that smoke was particularly good for us! 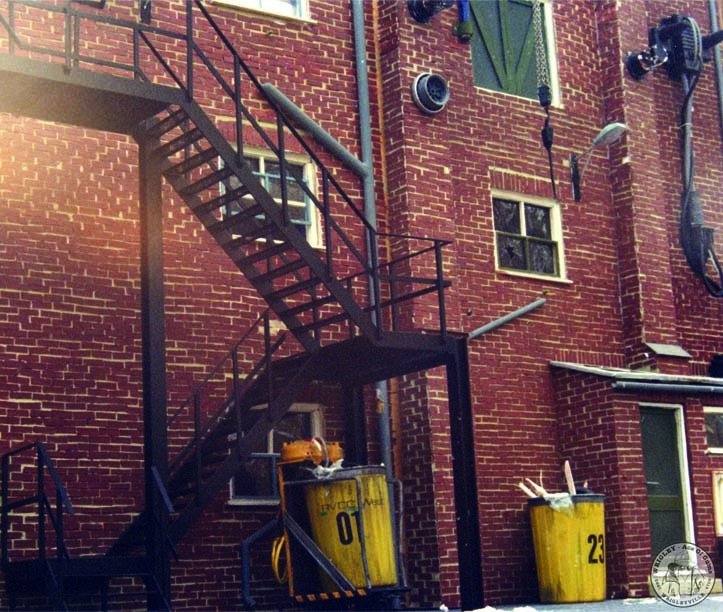 But once the smoke came down, all the practical lighting I had built into the set came to life. As far as I can remember we mostly used the ‘B’ setting on my SLR, stopped right down and hoped for the best. We also experimented with firing a flashgun through the windows or gaps in the set. We then had to wait until the film was developed to see if we got anything (or not!). 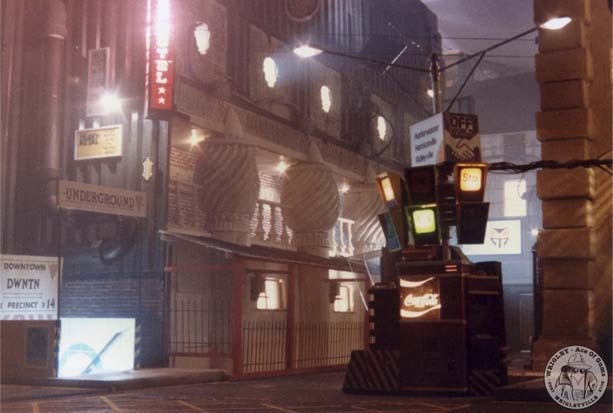 So here’s a small selection of images to give you an idea of what we did thirty years ago in a Blade Runner style. Red Brick Side - Detail. Red Brick Side - Daylight. Street View - Cadbury Apartments. Aerial View - Cadbury Apartments. Just recently we decided to revisit this project. 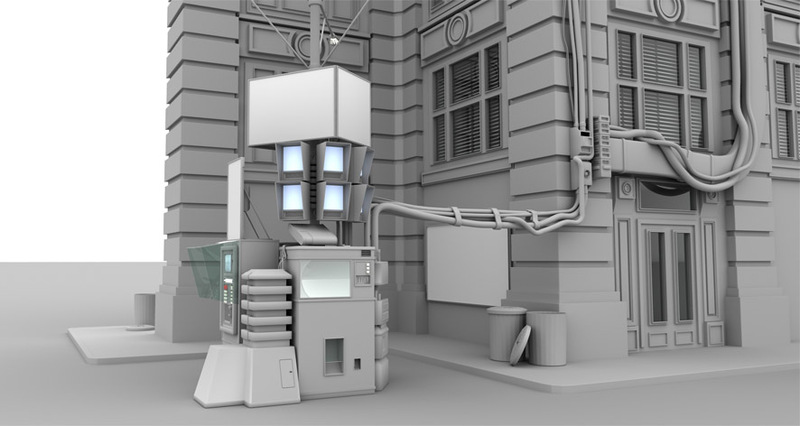 My friend is currently working on a CG version of Wrigleyville. He’s been posting on a 3D forum over the past couple of weeks. It’s early days. He’s starting with the Street junction unit and working out. With 30 years worth of hindsight and experience, he’s making a few tweaks and improvements here and there. Very impressive Colin It looks very real. I'm eager to see what your friend is going to concoct with the 3-D set. I wish I had more time (and money) to do some miniature on camera effects; was my passion years ago, and I had developed quite a few tricks to achieve some crazy stuff without the aid of CG, or wires for that matter. Feel free to ask, as you know, I like to share with everybody. Wow! That is just terrific. A lot of Blade Runner love in there. Thanks guys. Yes definitely a lot of Blade Runner love in there Andy. Maybe too much! joberg, I'm intrigued about your techniques. Tell us more. We were quite happy with our photographic results back then. If I could change anything I wish I would have built more height in the set so we weren't shooting off the top. I'll post either a link or some images of the new CG stuff later this week. I should try to find some of the blueprints I had done for some of the effects. I discovered, long ago, the fantastic use of non-reflective glass. Sometime, I would just put the model on top of a fairly large glass pane (2' X 4'...very heavy and lifted by 4 friends), then at my command, they would lower the glass + model toward a moving ground (large corridor rug with grass, dirt or a tarmac for example) being pulled by another person. Smoke effect + fan= great on camera shot. So to recap: moving background or ground in this case, moving non-reflective glass pane and model on top...ah the good old days! 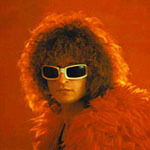 Joberg, what you have described sounds a bit like a live action version of ‘Multi Plane’. Would love to see some blueprints if you can find them. Here’s a few more details from Wrigleyville to complete the story. 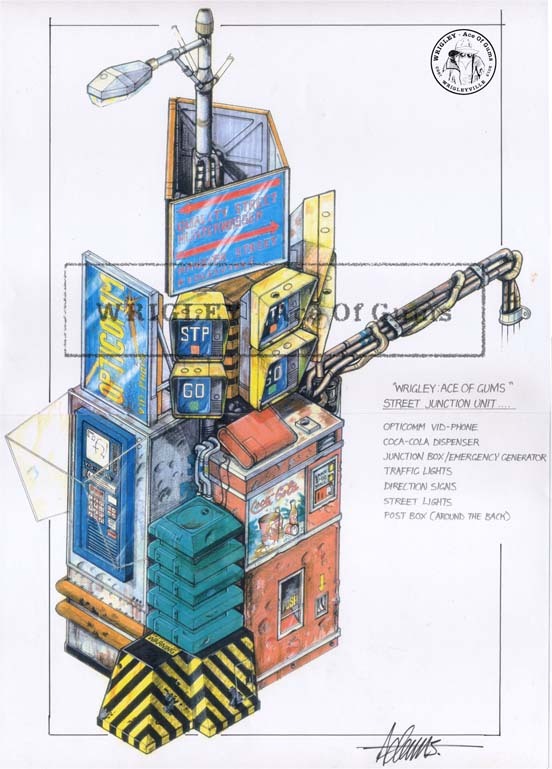 We’d based the corner building, at the front of the Alley, on the backlot elevations in the Blade Runner sketchbook. We used those same elevations as the basis for the background building. 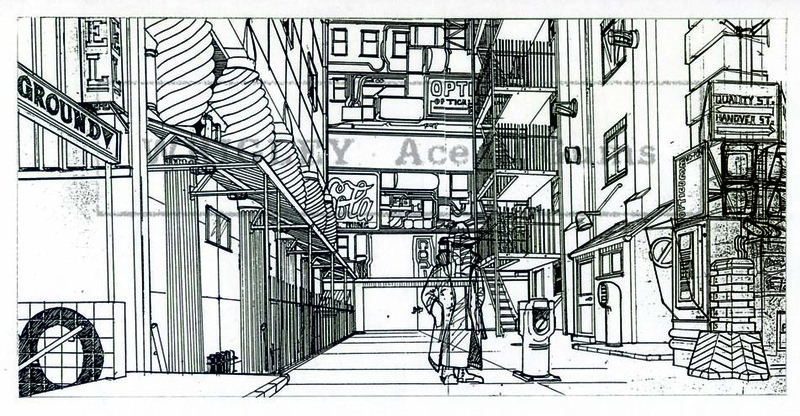 We then used the (backlit) curved shop front idea in one of Syd Mead production paintings (the entrance to Chew’s Eye World! ), to give the wall some interest and backlight Wrigley when he enters through the gate. Then we covered the rest in advertising billboards. Using film in jokes, iconic logo’s and things we liked at the time. Here’s a more detailed pencil sketch of Wrigley. 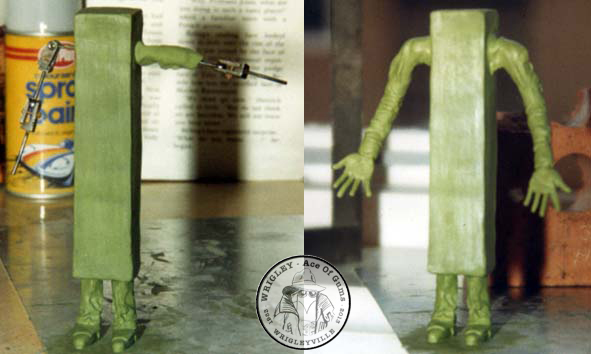 At the time I modelled some scale Wrigley maquettes in an air drying clay to get a feel for the character in three dimensions. 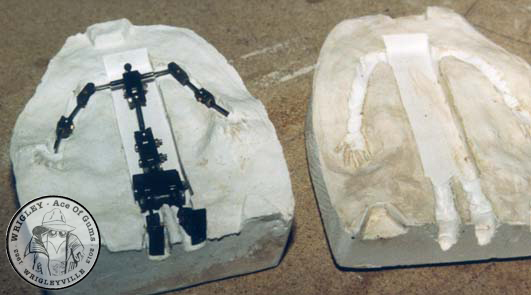 Next I built a ball & socket armature and sculpted Wrigley over the top of it. I then made a simple two part plaster mould. The intension being to have Wrigley cast in foam latex. Unfortunately that’s as far as I got with the puppet. 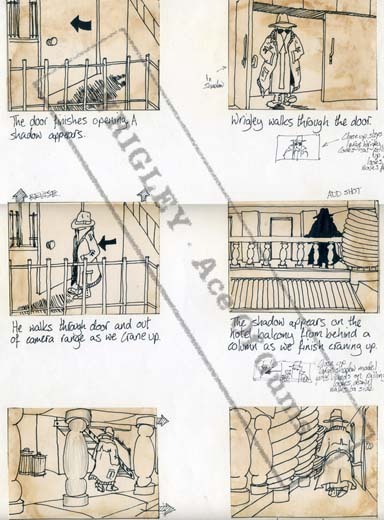 Here’s a sample of the storyboard showing Wrigley entering the alley and being watched by a mystery ‘shadow’ character up on the balcony. 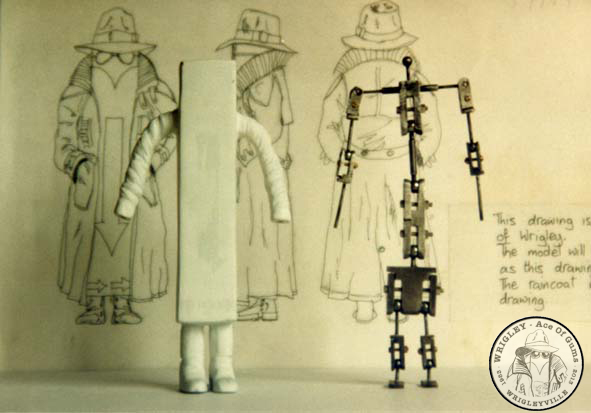 In retrospect we took on a large undertaking and didn’t really know enough about model animation. I think we had planned to make the film on Super 8 but it turned out the Super 8 camera we had was incapable of shooting single frame. Something to do with the sound. Maybe we just needed to buy a film cartridge with no sound! I realized there would be many problems associated with making Wrigley Ace Of Gums. His short legs would be a problem to get a good walk. Keeping a constant level of light and smoke over many hours filming would be another. I think there would have been many more. So we probably made the right decision not to make the film in the end. So to bring you right up to date on the project here’s a couple of recent image of my friends CG reworking of Wrigleyville. Just saw that thread a minute ago... WOW... GREAT WORK, Colin !!!!! from a design standpoint this is so great to look at. love the work put into this. im in the process of writing/penciling my own graphic novel, and its very much inspired by the world and aesthetic of blade runner. ive been meaning to post some of the work i have up here. but its real cool to see what others have created from how blade runner inspired them. good luck with the project! Thanks for your comments 1frankcastle4. I'm glad you found our little thirty year old project interesting. 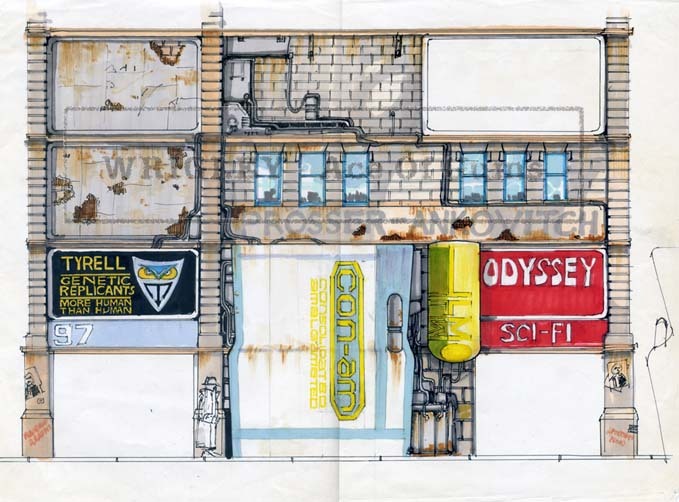 I certainly was inspired by Blade Runner and enjoyed making Wrigleyville all those years ago. I think my friend is planning to get back on with the CG version in the coming months. So it may be worth looking in again at the 3D forum I mentioned earlier in the thread. Good luck with your graphic novel. Any updates on this? It's looking really good! Welcome Kalel76; I know that Colin is in the middle of a few project if I'm not mistaken (the Alien flamethrower is one of the big one). Thanks for the interest in Wrigleyville. I assume you mean is anything happening with the CGI version of Wrigleyville. My friend has been busy of late and hasn't had any time to work on it. But the CGI project is still alive. He has other projects too so he rotates them. If he does anymore I'll post a link. Thanks for the quick response guys! Have a good weekend! 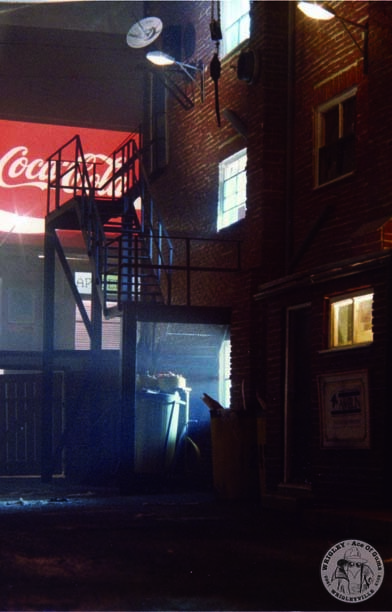 Over the Christmas break my friend has done a bit more on his CG version of Wrigleyville. 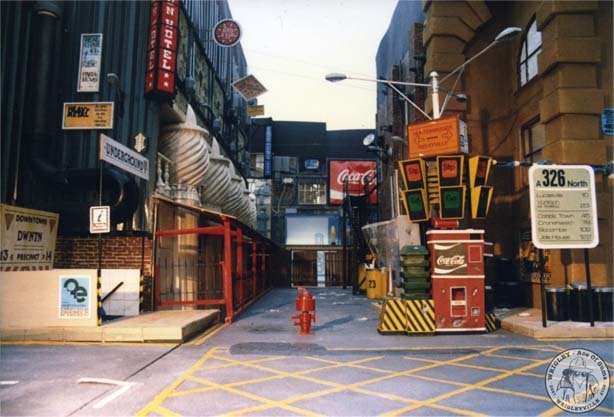 He's expanded on the original model using the Warner backlot buildings as a starting point. Here are a few images. If you are interested more and larger images can be found here.